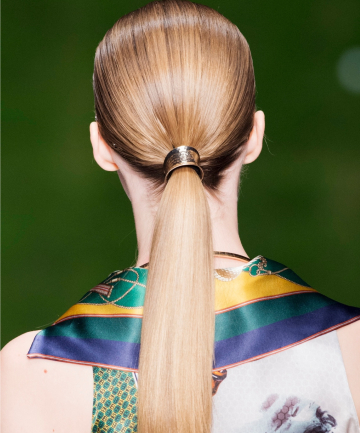 Looking to dress up your ponytail? There are few things more key in life than a good hair tie. Those little black elastics have been a permanent fixture on our wrists for years now: Dependable and always ready to swoop in and save the day whenever you need to get your hair out of your face. That said, sometimes you want to mix it up. Statement hair accessories have been getting more and popular lately, on the runways, on the red carpet, on the 'gram — they're everywhere these days. So, whether it's a stylish corduroy scrunchie or a sweet circle and stick set, these adorable alternatives to your typical hair tie will do just as good a job of holding all your hair back, while also adding a unique flair to your look.